The staff at Bishop’s Cellar are excited to have a few wines from Fattoria Fibbiano in the shop thanks to a happy accident at a Prowein, where Jason Macleod thought he was going to a meeting to taste Burgundies and ended up tasting some delicious organic Tuscan wines instead. He then suggested that our colleague Jason Macphee seek them out later at VinItaly to confirm that the wines he tasted were as delicious as he thought. Indeed they were and so we ordered them for you. Fattoria Fibbiano is a family-run farm. The whole family has lived and worked there since 1997. Giuseppe, the father, deals with the general management of the estate and takes care of the vineyards and countryside. Matteo, the eldest of the two sons, is in charge of marketing the wines and his brother, Nicola, is the winemaker who oversees the entire wine-making process. Three generations of the Cantoni family live in one part of the 1,200 m2 farmhouse which also houses the agritourism. The land surrounding the farm is only treated using organic fertilisers and human intervention is kept to a minimum. From the point of view of energy consumption, the agritourism is completely self-sufficient with a 30-KW photovoltaic plant, a solar plant for the production of fresh water, and central heating which uses the wood obtained from pruning the river banks and from clearing the woodland. Fattoria Fibbiano is a certified organic farm. 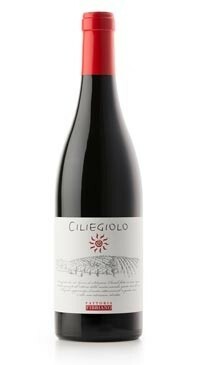 Made from Ciliegiolo grapes grown around the hills of Pisa, Tuscany. The grapes are hand harvested mid September, destemmed, crushed and fermented in stainless steel tanks with indigenous yeasts naturally present on the grape skins. The wine then goes into cement tanks for 4 months where malolactic fermentation takes place before a 12 months ageing period in Slavonian oak barrels. The result is a ruby red wine with intense cherry, raspberry and blackberry aromas, a full body with smooth tannins.